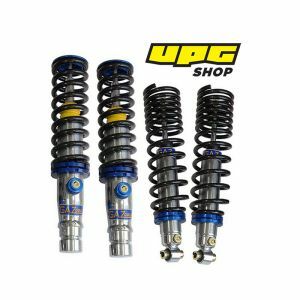 To get the best out of your Gaz Gold coilover kit, we can tailor can the damper valves and spring compression rates depending upon vehicle specification (plus what tyres are used) and intended use. We offer this service free of charge preferring customers get the best possible set-up for their cars. Our Gaz Gold kits are heavily discounted to ensure our customers receive the very best value for money. Designed to fit your car’s original suspension pick-up points for ease of installation and to comply with most tech regs. 42-way adjustable for bump and rebound damping. This adjustment comes from a single control knob on the side of the unit. Please see our External Reservoir section for Gaz Gold kits with separate compression and rebound adjustment. Most Gaz Gold dampers are constructed with 62mm bodies for increased oil capacity to prevent frothing and cavitation so the damping stays consistent throughout a race. All Gaz Gold dampers are fitted with a gas cell in the outer reservoir to pressurise the damping oil. The oil itself is a high viscosity index racing multigrade oil to prevent frothing, cavitation and fade in motor racing conditions. For increased strength and durability, dampers are fitted with larger 22mm diameter piston rods that have been induction hardened and chrome plated. Multi lip sealing and the outer seal is a metal encased wiper to clean the piston rod to extend the main seal performance and oil retention under extreme conditions. Lightweight billet alloy components are used (where possible) such as bases, end fittings, seats, lock rings, rod guides and gland nuts. The outer tube is steel with a nickel coating to provide the best anti corrosive finish possible. All outer alloy components are anodised. This reduces weight and increases life and performance. All units are provided with high quality race spec coils springs in various rates and diameters. Every unit is fully tested and dispatched from the factory with an individual dynometer report and built to accredited ISO9002 standard, manufacturing processes are TuV approved. Please note the illustration used may not feature your exact vehicle. Gaz coilovers take roughly 3 weeks to build and deliver from date of order. This promotion only applies to Bulgarian citizens.